I recently attended a baby shower where the theme was 'ready to pop' and by pop I mean popcorn! The table was laden with bowl upon bowl of different flavoured popcorn while every other dish was sized down to resemble some form of a pop. When I first learned of the theme I was so excited by the possibilities, but it soon had me racking my brain trying to come up with a dish that was 1) relatively healthy 2) savory in nature and 3) looked like popcorn. Eventually I hit upon the idea of coating mini turkey meatballs in a sesame seed crust to resemble little popcorn balls. Bloody brilliant was what I thought. That was until I realised no such recipe existed on the internet, at least none that I could find. After a little improvising and trial and error I believe I've finally perfected a recipe that was good enough to serve up at a party and more importantly, good enough to share on this blog. 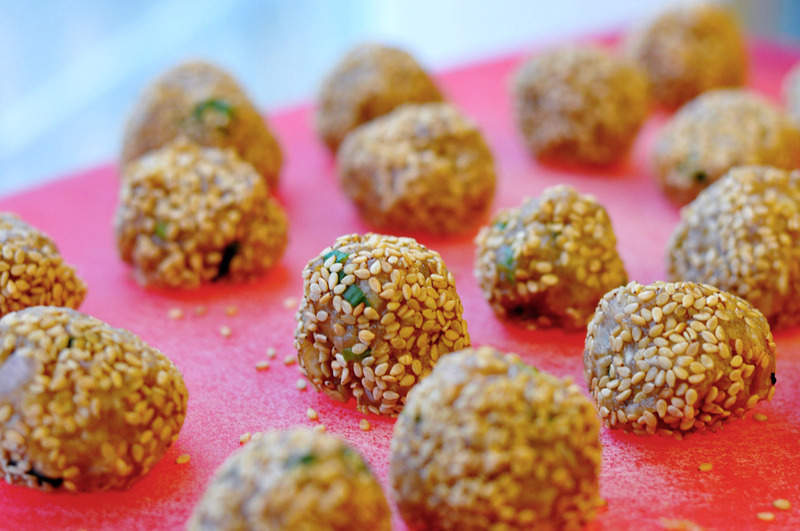 So here you have it- mini thai style turkey meatballs in a sesame seed crust. Enjoy! 1. Combine turkey, egg, panko, ginger, garlic, shallot, scallions, soy sauce, sesame oil, salt and cooking wine in a large bowl. 2. Mix with hands till well combined. Microwave a spoonful of mixture to check if more seasoning is required. 3. 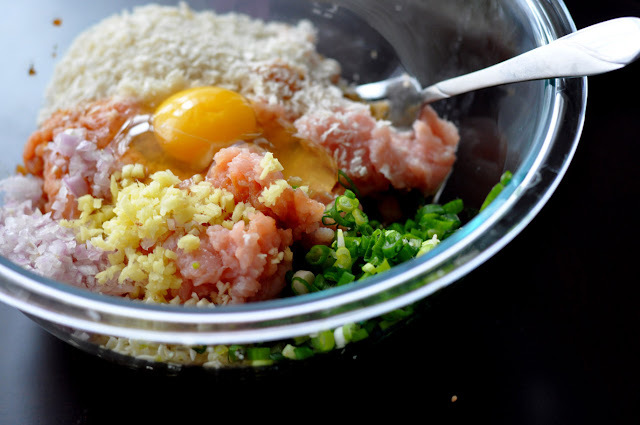 Shape 1tsp of meat mixture into a ball and place on tray. Repeat. 4. 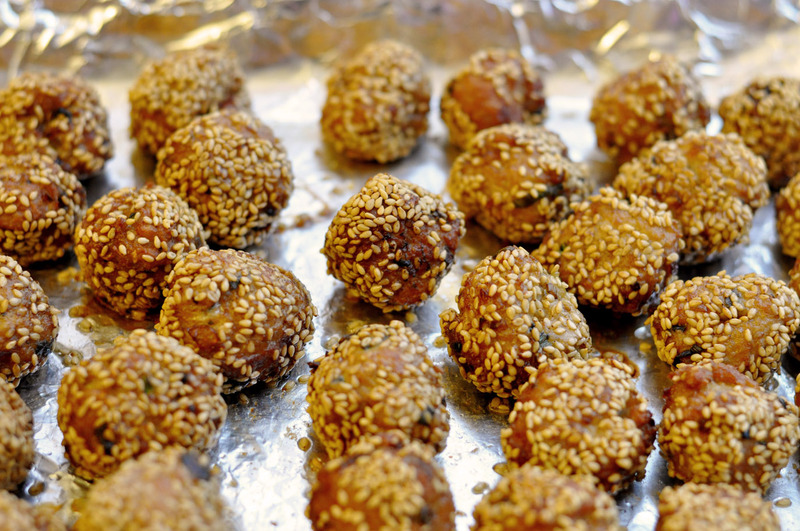 Once you have a full tray of meatballs, generously coat with sesame seeds. 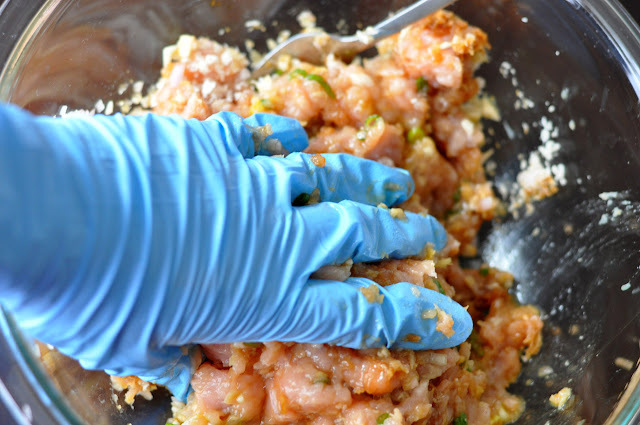 Shake tray to coat underside of meatballs. 5. Heat up enough peanut oil in a pan so meatballs are half immersed. 6. 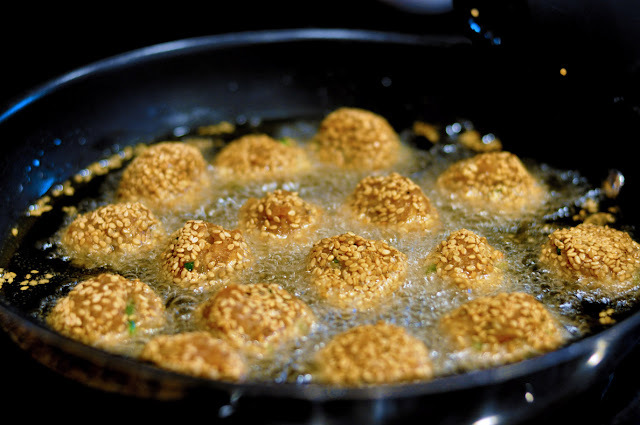 Fry meatballs on medium heat for 2 minutes on either side to crisp the sesame seeds. 7. Transfer back to tray and finish cooking in oven at 350F degrees for 5 minutes depending on size of meatballs. 8. 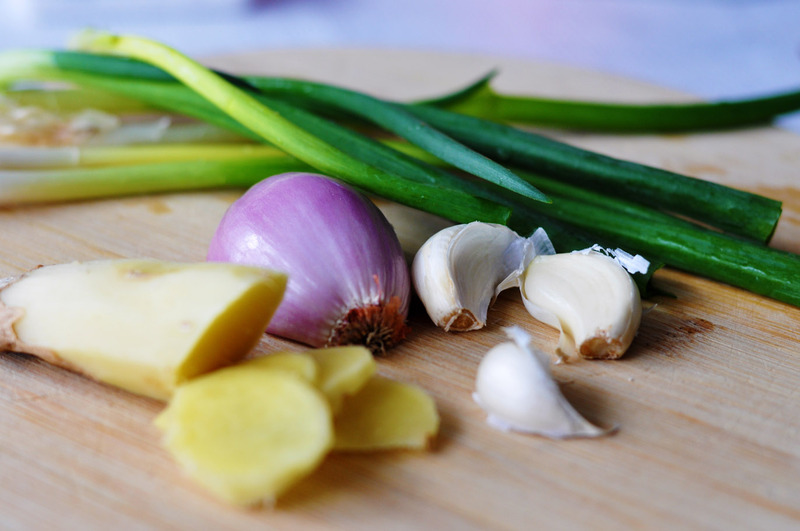 Serve with ample sweet chili sauce or another condiment of choice. These look and sound delish! A perfect party app but I really want to make them just because now! great minds think alike. I just made a sesame crusted tofu..... This looks healthy and delish Jenee. And super duper cute. Anyone would love to dig in. Jenee!!!! These look molto delizioso:)! I must make them for the fam bam! I know they will love it! And gorgeous presentation too! Great photography; beautiful presentation and I'm sure they tasted delicious! Good job! I would draw a total blank on what looks like popcorn, but you managed to invent a dish that not only looks it, but I am sure is also delicious. Impressed! That looks absolutely delicious and I bet it also tastes the same :) Thanks for making me hungry! What a creative party nosh! 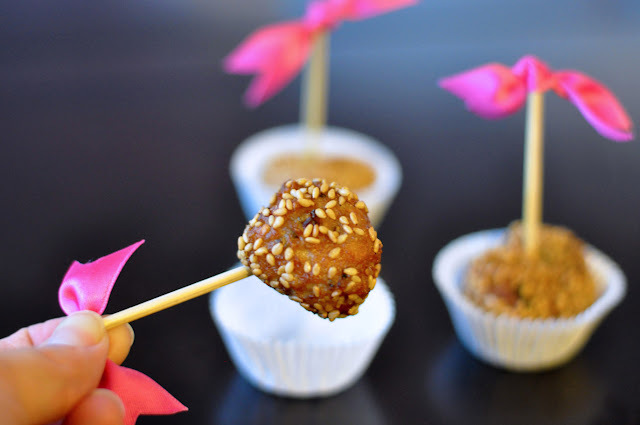 These look super yummy, I'm not a big sesame fan, but I bet I would love the crunch they give here! Perfect party finger food and I am sure the taste is as good as they look! Definitely book marking! 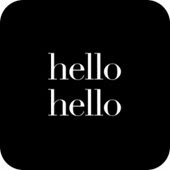 PS: Left a message with your blog adress, ok? These are amazing! Props to you for improvising it too! I'm definitely pinning this to try later! These look SO good. And that heart photo with the seeds is amazing! 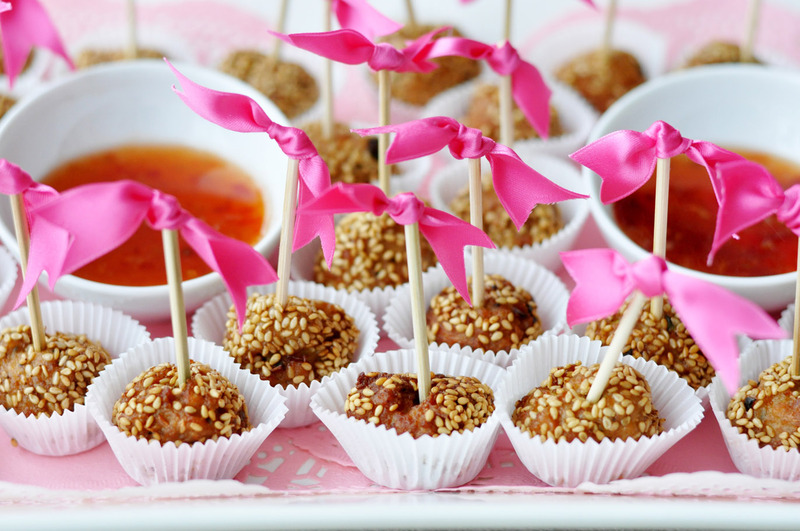 I will soo be trying this....the hubs loves sesame and I love turkey meatballs....win-win!!!! I have NEVER heard of Turkey meatballs, this is such a unique idea. I need to give this a try, except I can't cook if my life depended on it. On a side note, the pictures are gorgeous. What camera do you use? OK seriously...you make everything look so beautiful!! I don't eat meat but you could have fooled me because these look like delicious cake pops of something...amazing! Wow, that's such a creative idea!! And the end result looks delicious! These look AMAZING! Thanks for sharing the receipe. I've got these on my 'must cook' this week list! Yummy yummy! I love meatballs but I haven't tried turkey ones before. I'm sure they would taste good. The photo steps look easier to follow! The words scare lazy people like me. I guess I can improvise my own meatballs just from your pictures. I bet the dish was a hit! I love this idea, Jenee! 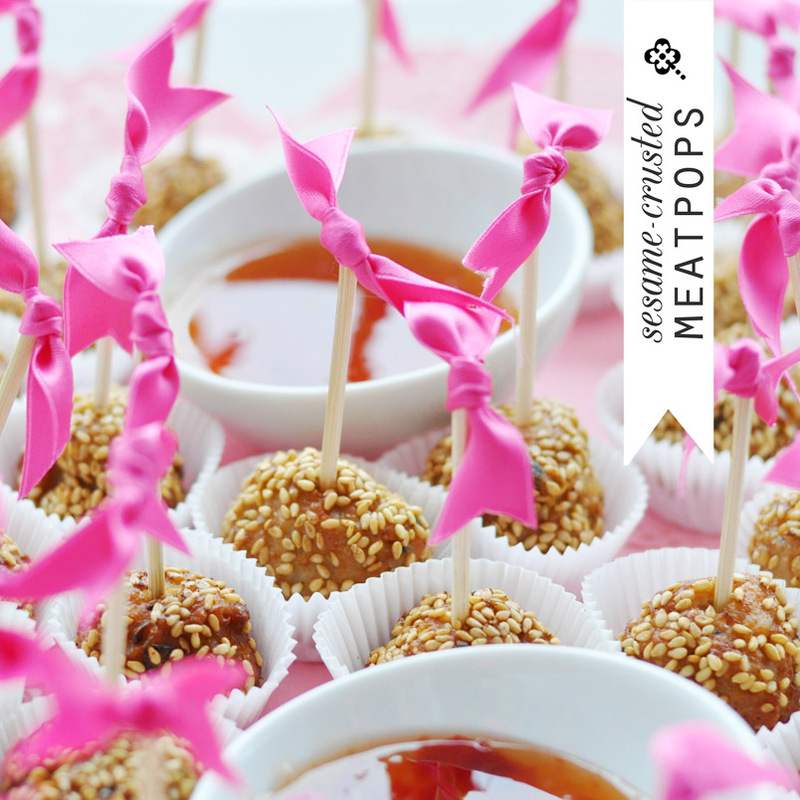 First of all, the popcorn-themed shower idea got me right away, popcorn has been my favourite snack since I was little :) But the idea of popcorn-like treats is even more clever and your pretty little turkey meatballs look almost too cute to eat! I'm a vegetarian but I'm always on the hunt for cute recipes like this for entertaining, I'm definitely bookmarking this one - thanks so much for sharing! Mmmm! Those look soooo good. 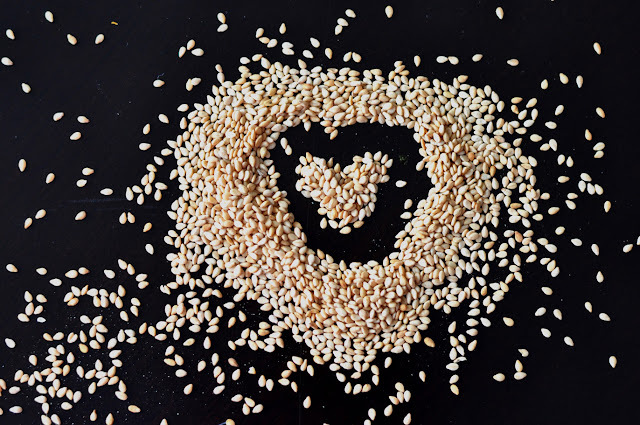 I never had them coated in sesame seeds. Beautiful!